In 1 Corinthians 11:17-34, Paul describes an extremely dysfunctional church event. When the church gathered to observe the Lord's Supper, there were divisions and factions (v. 18-19) due to the fact that people were not sharing food with those who were hungry and were eating before the others arrived (vv. 21, 33-34). What could have possessed them to act in such an unloving way during one of the holiest events in the life of their church? In his book St. Paul's Corinth: Texts and Archaeology, Jerome Murphy-O'Connor suggests a historical context which could help explain this passage. His suggestion centers around the fact that wealthy homes in that culture typically had two public areas: a room just inside the entrance called an atrium and a dining room called a triclinium. Our picture of the week is an example of an atrium found in one of the houses at Pompeii. This photo comes from Volume 14 of the revised and expanded version of the Pictorial Library of Bible Lands, which focuses on Italy and Malta. 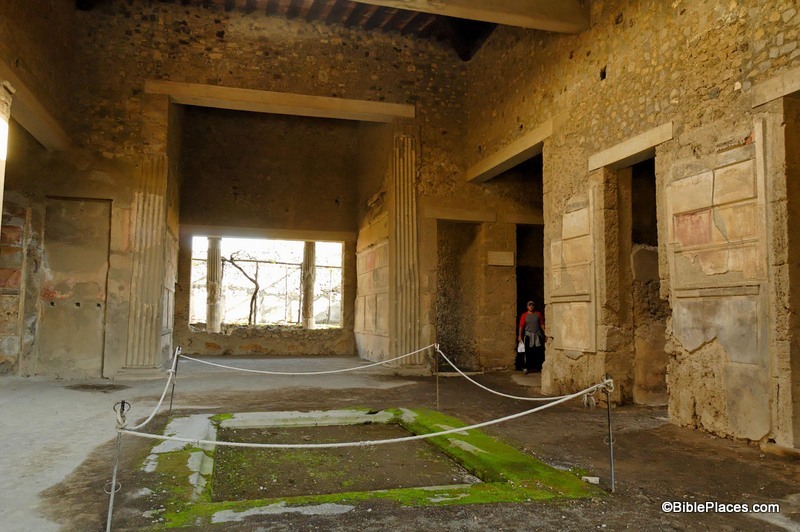 The photo is entitled, "Pompeii House of Sallust Atrium." An atrium typically had a a rectangular pool in the center of the room called an impluvium. The reconstruction is hypothetical, but no scenario has been suggested which so well explains the details of 1 Cor. 11:17-34. The admonition "wait for one another" (v. 34) means that prolambano in v. 21 necessarily has a temporal connotation; some began to eat before others. Since these possessed houses with plenty to eat and drink (vv. 22, 34), they came from the wealthy section of the community and might have made a contribution in kind to the community meal. This, they felt, gave them the right to think of it as 'theirs' (to idion deiphon). Reinforced by the Roman custom they would then have considered it their due to appropriate the best portions for themselves. Such selfishness would necessarily include a tendency to take just a little more, so that it might happen that nothing was left for the 'have-nots' (v. 22), who in their hunger had to content themselves with the bread and wine provided for the Eucharist. However, as Paul is at pains to point out, under such conditions no Eucharist is possible (v. 20). Excerpt is taken from Jerome Murphy-O'Connor, St. Paul's Corinth: Texts and Archaeology, Good News Studies, vol. 6 (Wilmington, DE: Michael Glazier, Inc, 1983), 153-161, and can be purchased here. This and other photos of Pompeii are included in Volume 14 of the Pictorial Library of Bible Lands and can be purchased here. More information on Pompeii and additional photos (including another atrium) can be found on the BiblePlaces website here.